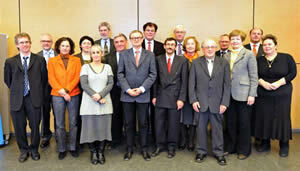 On 7 January, in Graz, Austria, the INGO-Professional Network Forum on language education was founded at the European Centre for Modern Languages (ECML) of the Council of Europe. The first ever meeting of its kind brought together eight renowned international associations acting in this area which all signed bilateral cooperation agreements with the ECML. Representatives from the Language Policy Division of the Council of Europe, the Multilingualism Policy Unit of the European Commission, and the Canadian institutional ECML partner – the Official Languages and Bilingualism Institute of the University of Ottawa (OLBI) also participated in the meeting. Professor Henry Widdowson (Vienna University) provided comments from the perspective of an independent expert in the field. The one day event enabled the partners to gain a common understanding of the working context and the respective competences of the associations (1) Through this 1st Forum the Centre seeks to further intensify its links with professional bodies working in language education and to create synergies between organisations with similar aims. The modalities for ongoing cooperation have already been defined in bilateral cooperation agreements signed between the European Centre for Modern Languages and the Official Language and Bilingualism Institute (OLBI) at the University of Ottawa, Canada, the European Association for Quality Language Services (EAQUALS), the World Federation of Modern Language Associations (FIPLV), the Association of Language Testers in Europe (ALTE), the International Association of Applied Linguistics (AILA), the International Certificate Conference (ICC), the European Confederation of Language Centres in Higher Education (CercleS), the European Association for Language Testing in Europe (EALTA) and the CEL/ELC, Conseil européen pour les langues/European Language Council. – which all deal with policy, research and practice to a different extent – and to become more aware of the common issues shared and challenges identified within the Professional Network Forum. Harald Hartung, Head of the Multilingualism Policy Unit of the European Commission, praised the initiative to establish the network and saw its future success as lying in “the smart selection of topics”. In her closing statement, Johanna Panthier, the representative of the Council of Europe Language Policy Division, encouraged the associations which enjoy participatory status with the Council "to make better use of this platform and attend appropriate meetings organised by the Conference of INGOs, if need be on a rotation basis". After lively discussions on the key challenges facing language education today and on suitable areas for common action, the network unanimously agreed to further develop cooperation. The Graz Declaration 2010 represents a summary of issues raised in the discussions, and provides the basis for the creation of, as well as for the activities to be undertaken by, this new network. "Noting that the development and reinforcement of this co-operation between INGOs and the Committee of Ministers and its subsidiary bodies, as well as with the Parliamentary Assembly and the Congress of Local and Regional Authorities of Europe has led to the "Quadrilogue" which is, within the Council of Europe, an expression of democratic pluralism and an essential element for the further development of a citizens' Europe; "